Back then Phil worked in a Dixons store, and although initially popular and undeniably cool, LED watches became completely obsolete almost overnight when low-battery usage Quartz LCD technology became available. As more and more LCD watches took up shelf space, LED watch sales plummeted, and it wasn't long before manufacturers began recalling them for recycling. Not wanting to see the watches wasted, Phil enquired as to whether or not it would be possible to buy some of the dead stock from Commodore - and a short while later he became the owner of over 3000(!) watches and parts, bought at a frankly ridiculous knock-down price (using money borrowed from his parents). After initially managing to sell a few here and there, it wasn't long before he began to regret his purchase - as the 1980's and 1990's rolled on he still had a garage completely full of unwanted watches, and he even considered dumping the entire lot for scrap. But then in the 2000's Yahoo Auctions and later ebay matured into an easy way of shifting this insane quantity of vintage hardware for a decent price. Check out his seller page here - note that he's been a ebay member since 2001! 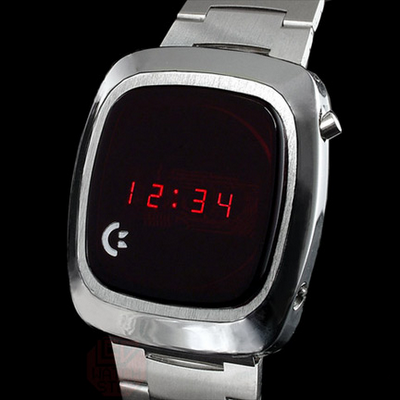 So, a short while later I walked out of the shop with my very own, genuine Commodore LED watch. And being the top bloke he is, Phil has offered RGCD three more identical watches as prizes for our C64 16KB game development competition - and at an sale value of just shy of £100 each, I cannot express in words how totally awesome this is. The moral of the story? Visit your local IT shop once in a while and help keep face-to-face independent specialists in business - you never know what retro treasure you'll find lurking at the back of the store.